Cema is a 13 year old girl. Cema was orphaned at a young age but was fortunate to be adopted by a family in the village. They live in a one room house and her adopted mum and dad struggle to meet day to day living costs and school fees. 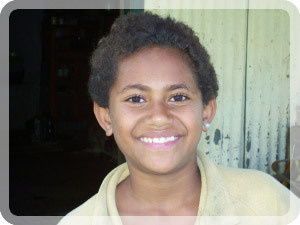 Cema enjoys attending school and her favourite school subject is maths. Cema travels to school each day on foot, walking 3km along the cane train line each way. When she is not at school she loves to play with friends in the village. When she grows up, Cema wants to work in a hotel. Cema is a dedicated, enthusiastic and hardworking child. She has the capability to excel in her school work if her school needs are fully supported. Cema is a student deserving assistance towards her educational needs. Her parents were badly affected by the deluge and are still struggling to rehabilitate.